Last year the luxury group LVMH challenged upcoming artist, Cedric, to a battle in court. The dispute was about print clothing featuring art inspired by the Champagne brand Dom Pérignon. LVMH was found to be in the right according to the Brussels Commercial Court, but this was not enough, because Cedric's art on canvas was questioned and also, in the same movement, almost all Pop Art. This prompted the commercial court to put a preliminary question to the Benelux Court about whether artistic freedom is a valid reason to use a trademark. The attack upon an artist by a well known multinational is very rare, but it signals dangers for the arts sector worldwide. Because the organization Artists United has not failed to notice this, they have decided to defend the importance of their sector. The question referred by the Brussels Enterprise Court actually refers to a trade-off between an economic interest on the one hand and the fundamental right to freedom of expression on the other. Lawyer Joris Deene, specialist in intellectual property, privacy and ICT law: "Artistic freedom has long been at odds with the protection of intellectual property rights. Both the European Court of Human Rights and the European Court of Justice have already ruled that intellectual property rights must be in balance with other fundamental rights (such as freedom of expression). The European Trade Mark Directive specifically states that freedom of expression must also be guaranteed in trademark law. In legal literature it has often been suggested that one should understand freedom of speech under 'valid reason' in trademark law. The Benelux Court of Appeal therefore has an excellent opportunity to balance the scales between intellectual property rights and freedom of expression. " Attacking the arts sector is not something that luxury brands are known for. On the contrary, luxury brands make eagerly use of the fashion world, celebrities and artists. It also does not appear that this synergy will change in the near future. 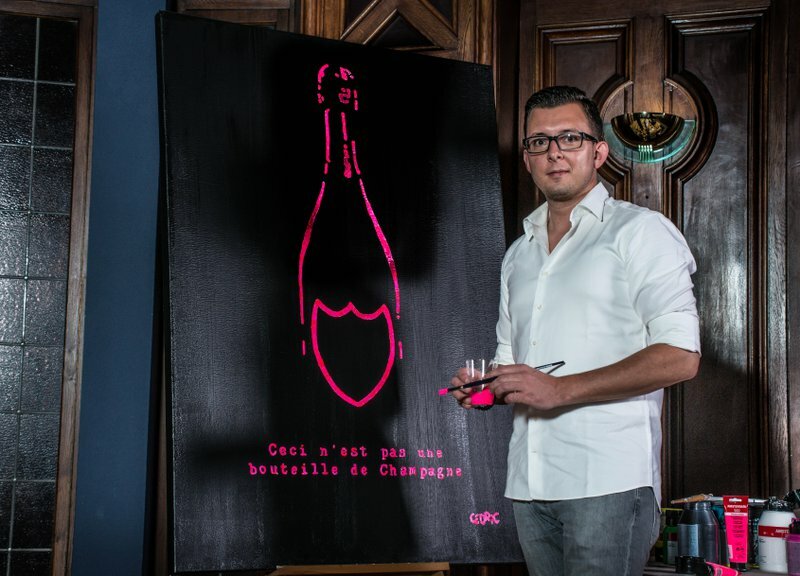 This is illustrated by Dom Pérignon's recent collaboration with Jeff Koons, Michael Riedel and the launch of their Andy Warhol series. During the past few years, Cedric has organized various exhibitions in Belgium, Monte-Carlo, St-Tropez, London and Marbella. While most of his works are sold in Europe, he also has clients in the United States and Asia. In an attempt to make his voice heard, he founded the website www.notdomperignon.com, where he wrote down his reservations about this attack.